Let me get straight to the point…..I am BEYOND EXCITED for this post because not only was I thrilled with the results of this amazing cake, but I managed to shoot my FIRST VIDEO EVER on how to create the perfect Chocolate Meringue Buttercream (see below)!!! 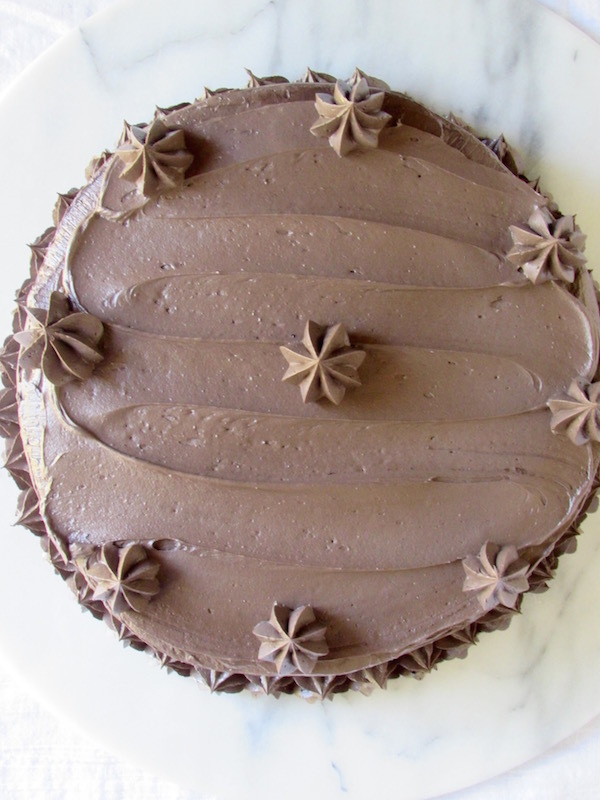 There are fewer pleasures in life that compare to a luscious chocolate cake with chocolate buttercream…I am right or am I right!? Chocolate has the ability to get those endorphins going and mimic the feeling of being in love. Given its transformative qualities, it comes as no surprise that chocolate cake would be at the top of just about everyone’s list of favorite ways to indulge in this forbidden fruit. Being a baker myself, I just HAD to create a chocolate cake that was hands-down the BEST version of what I consider to be the pinnacle of all desserts. Look, we’ve all had chocolate cake a million and one times in our lives. It seems to be the only dessert option on every restaurant menu (well, that and cheesecake) and often it’s the same-old same-old cake. Usually it’s piled a mile high and contains enough sugar to send you into a diabetic coma. Start by browning the butter in a saucepan over medium heat until it starts to smell nutty and becomes golden brown. Take it off the heat as soon as it reaches this stage to stop the cooking process. 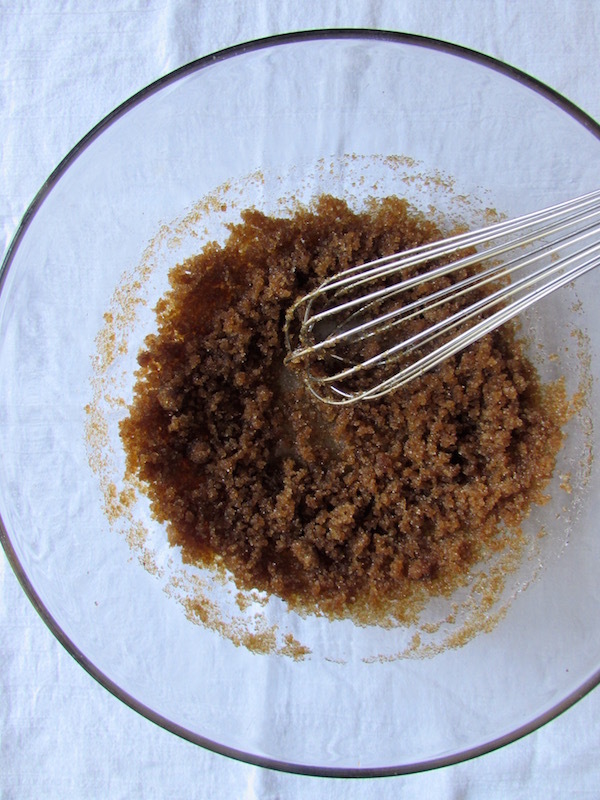 Whisk together regular sugar, brown sugar, and salt in a bowl. Let the butter cool for a few minutes, then whisk it into both sugars until combined and absorbed. Whisk in the eggs and vanilla. 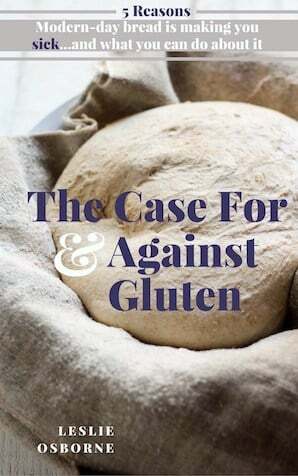 In another bowl, whisk the gluten free flour (I used Bob’s Red Mill 1-1 Baking Flour) or regular all purpose flour with the baking powder, espresso powder, and cocoa. 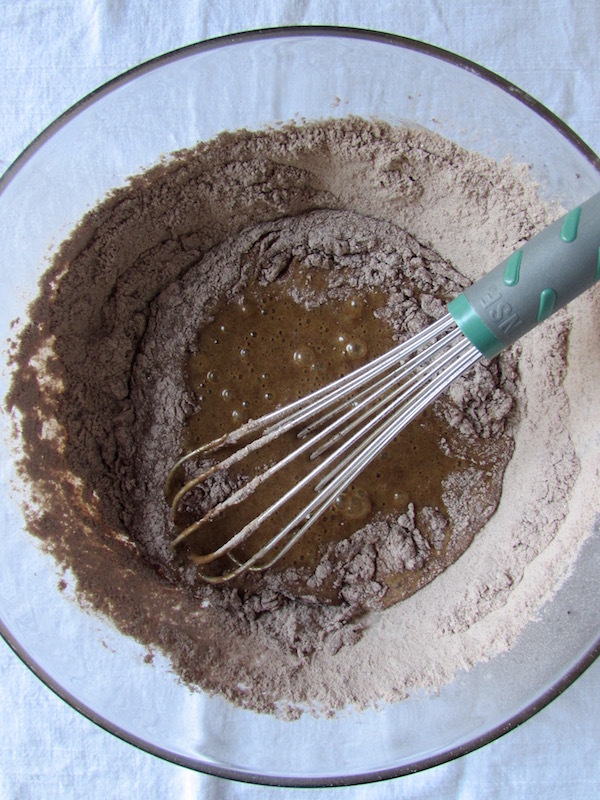 Once the flour is fully incorporated, add the warm water (this will help to bloom the flavor of the espresso powder). If you haven’t tried espresso powder before in chocolate recipes, you are in for a treat! Chocolate and espresso go together like bread and butter. Although you won’t taste the flavor of the espresso, it enhances and intensifies the flavor of chocolate. If you don’t have espresso powder, you can make some really strong coffee, measure 1 cup and substitute that for the plain water. Now we must pour the batter into two 9-inch cake pans. I prefer to butter the pans and cut out sheets of parchment paper into rounds to fit in the bottom of the pans. I butter the top of them as well. This ensures that your cake will not stick to your pan! I have had many cake fails when I tried to butter and flour the pan only. Inevitably, a little bit would stick, thereby ruining the cake’s shapes. So take the extra time to flip your pan over and cut out the parchment to fit the inside. Pour equal amounts of the batter into the pans and bake at 350 degrees until the cake is set and starts to pull away from the sides of the pan. Now here is what I’m really excited about! I made a video tutorial of how to make the chocolate buttercream. I love this recipe because it’s a “hybrid” buttercream. 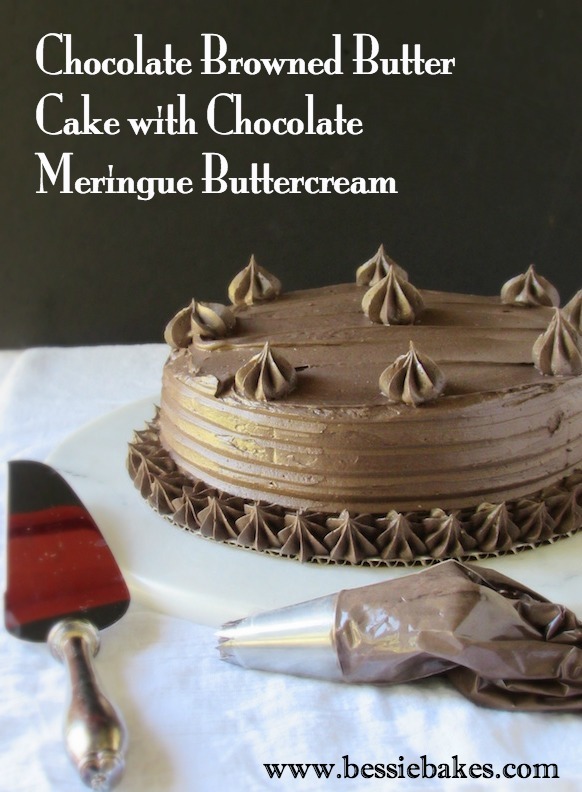 It’s a cross between an Italian meringue buttercream and an American buttercream. Italian meringue buttercream is a meringue with a lot of butter added. It’s barely sweet and full of buttery goodness. American buttercream is essentially butter and a ton of powdered sugar. To get the stability that you want, you have to add buckets of powdered sugar, which I find makes it overly sweet. The solution….make a meringue buttercream, but add a little powdered sugar for a more stable and perfectly sweetened buttercream. See below!! Now put your beautiful cake together and serve! Browned butter and brown sugar add deep caramel flavors to a rich, yet light and fluffy chocolate cake. 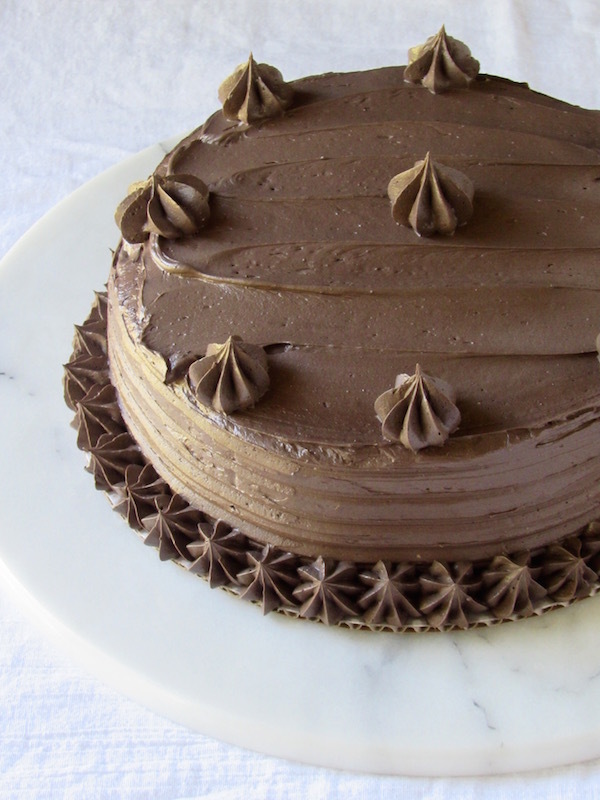 Watch a how-to video on making a not-too-sweet chocolate buttercream. Heat the 9 Tbsp. of butter in a medium saucepan over moderate heat. Cook until butter is golden brown and has a nutty fragrance. Remove from the heat and let cool for a few minutes. Whisk together the sugar, brown sugar, and salt. 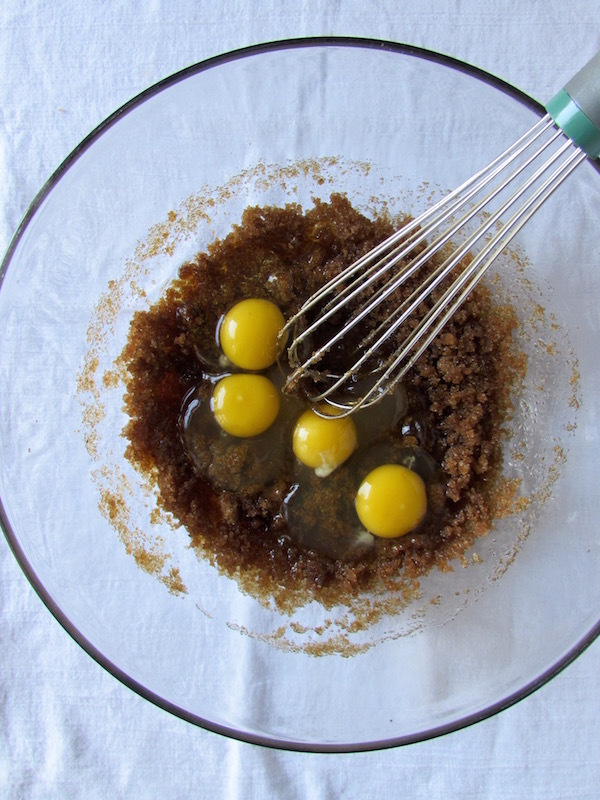 Whisk in the browned butter until fully combined. Whisk in the vanilla and eggs, one at a time. 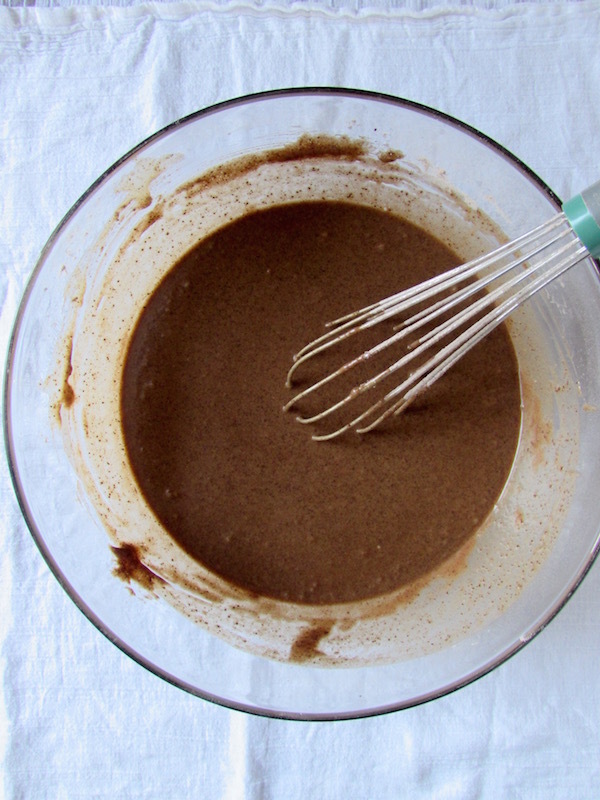 In a separate bowl, whisk together the gluten free flour, cocoa, baking powder, and espresso powder. Incorporate the dry ingredients into the wet ingredients. Whisk in the warm water until fully incorporated. 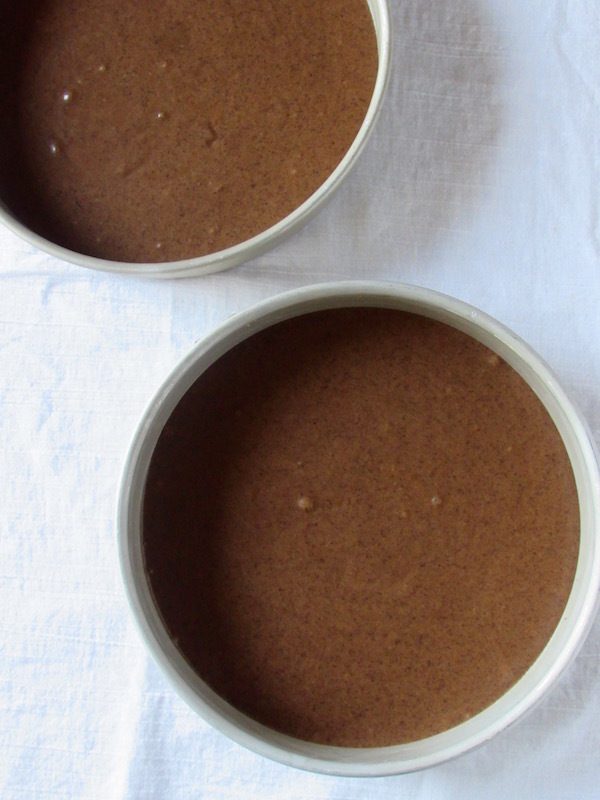 Butter two 9-inch round cake pans. 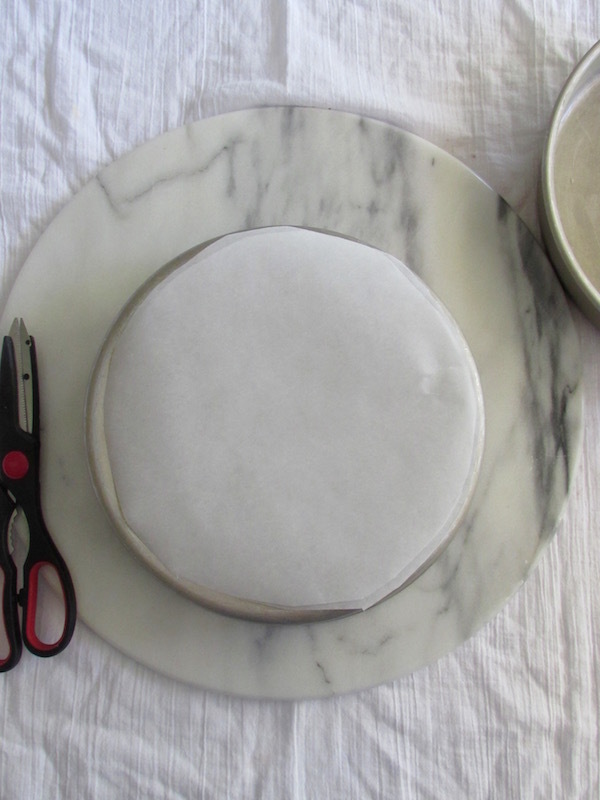 Cover the bottom of both pans in parchment paper rounds. Butter the top of the parchment. Fill the pans with equal amounts of batter. Bake in the middle rack until the cake is set and the edges begin to pull away from the pans, about 15-20 minutes. Let cool on a wire rack. Once cooled, you can wrap them in plastic wrap and freeze. This will make it easier to frost the cakes. In a small saucepan, heat the corn syrup, water, and sugar over medium to medium high heat. Do not stir. Insert a candy thermometer and simmer until it reaches 244 degrees. Remove from the heat. While the syrup is simmering, whisk the egg white powder, water, and salt in a standing mixer over medium high speed. Once the syrup reaches 244 degrees, turn down the mixer to low speed. Pour in the syrup in between the whisk and bowl to keep it from sticking to the bowl. Once the syrup is incorporated, turn the speed up to medium high and whisk until you have firm peaks and the bottom of the bowl is cool to the touch, about 10-15 minutes. Whisk in the softened butter in small pieces, a little at a time. The meringue might deflate a bit, but don't worry, keep whisking! Turn the speed down to low and add the powdered sugar and cocoa, a little at a time, scraping down the bowl to incorporate. Frost the cake and voila! Howdy! Someone in my Facebook group shared this site with us so I came to take a look. I’m definitely loving the information. I’m bookmarking and will be tweeting this to my followers! 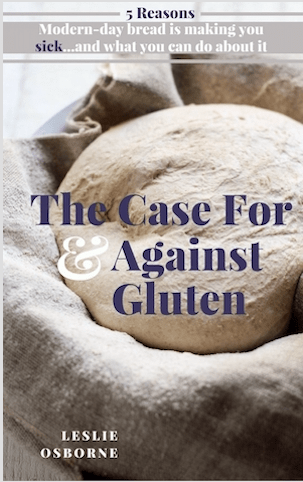 Outstanding blog and great design. Thanks you so much to share this lovely recipe with us.